When the SLK first appeared as a production model in 1996, it caused a sensation and founded a new generation of roadsters. For the first time, Mercedes-Benz had produced a roadster whose vario-roof redefined the roadster segment by combining open-air driving pleasure with uncompromised comfort in poor weather that had never been available before. Furthermore, the SLK started its career in the launch color Yellowstone, an unusual choice for Mercedes-Benz. 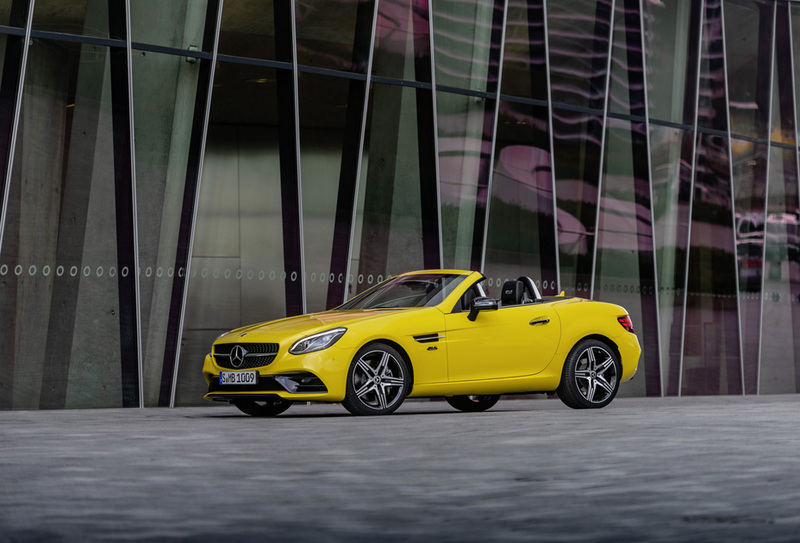 In honor of this world premiere, the Final Edition of the AMG SLC 43 is available in the exclusive paint finish Sun Yellow. Boasting an extensive range of equipment and unique interior details, the special edition of the SLC marks the pinnacle of the current model generation. The 2020 Mercedes- Benz and Mercedes-AMG SLC Final Edition will arrive in U.S. dealerships in 2020. Painted in Selenite Grey, the SLC 300 Final Edition boasts a distinctive look with an AMG Styling front bumper with trim strips sporting a silver chrome finish on the lower section. The door handles, mirrors and rear brace feature a high-gloss black finish with exclusive "SLC Final Edition" badges on the front fenders, below the chromed fin. Also eye-catching are the standard-fit 5-spoke AMG light-alloy 18-inch wheels with high-gloss black finish. The special model is based on the AMG Line, which includes AMG Styling bumpers at the front and rear, a sport suspension with 10 mm lowering as well as a larger braking system with perforated brake discs and front calipers sporting "Mercedes-Benz" lettering as standard equipment. The Grey seat belts echo the color of the topstitching. Carbon-fiber look leather inserts in the head restraints and the upper section of the seatbacks round off the exquisite interior design of the SLC Final Edition. The head restraints and the selector lever of the automatic transmission are covered with carbon leather and bear silver SLC lettering. The trim elements on the instrument panel and the center console sport a bright aluminum finish. The standard-fit multifunction sport steering wheel combines carbon leather in the upper and lower segment with smooth nappa leather in the grip area. Sporty details of the steering wheel are the flat bottom, the 3-spoke design, the black paddle shifters and the spoke faceplate with "Mercedes-Benz" lettering. The two-tone leather appointments in Black/Silver Pearl with Grey topstitching and seatbelts, as well as carbon-fiber look leather applications, provide visual highlights in the interior. The AMG Performance steering wheel with carbon- embossed leather in the upper and lower segment, as well as Nappa leather in the grip area, features a crystal grey 12-o'clock marker and an additional "AMG EDITION" badge on the steering-wheel trim. The AMG Final Edition of the SLC 43 has numerous comfort features from series production, including AIRSCARF neck-level heating, seat heating for the driver and front passenger as well as the Memory package for the exterior mirror, seat and steering column settings.